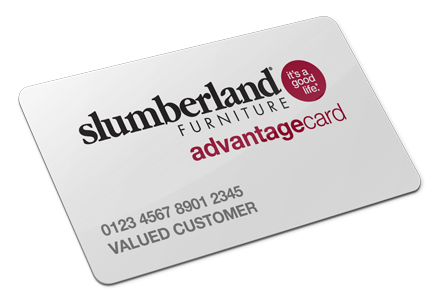 By opening Your Slumberland Advantage Credit Card*, you become a Member of the Slumberland Advantage Club Rewards Program, a Membership Program administered by Slumberland Furniture with no membership fee. The Rewards Program is automatically available to Slumberland Advantage Credit Card Account customers. *The Slumberland Advantage credit card is issued by Wells Fargo Bank, N.A. “Account” means a Slumberland Advantage Credit Card issued by Wells Fargo Bank, N.A. “Net Purchases” means purchases charged to Your Account minus returns and adjustments. “You” and “Your” mean each person that has an Account. 2. Earning Rewards. Rewards earning level and Advantage Club Rewards Certificates are based on net purchases of finalized merchandise at the end of each Reward Program Cycle charged to your Slumberland Advantage Credit Card on eligible merchandise. (2) Eligible merchandise includes all merchandise sold by Slumberland stores but does not include merchandise purchased with Slumberland Advantage Club Rewards Certificates, gift certificates, and/or gift cards. 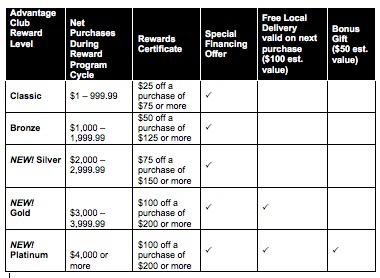 Each Rewards Program Cycle lasts six months. The first cycle and each subsequent cycle will run from open of business on November 1 to close of business April 30 with Rewards Certificates for this cycle issued in June. The second cycle and each subsequent cycle will run from open of business May 1 to close of business October 31 with Reward Certificates issued for this cycle in January. 3. Earning Level. Slumberland Advantage Club Rewards members can achieve 1 of 5 potential earning levels (each “Earning Level”) for each Reward Program Cycle. Members qualify for an Earning Level when their combinations of net purchases during a Reward Program Cycle total. Members qualify for an Earning Level when their net purchases during a Reward Program Cycle fall within the specified dollar ranges noted on the chart on the front side [of this letter]. A minimum purchase is required for redemption of your Rewards Certificate and special financing offers. Minimum purchase requirements are specified on the Rewards Certificate and special financing offer coupon. Slumberland Advantage Club Rewards Certificates are valid during the timeframe stated on the Rewards Certificate. Lost or expired Slumberland Advantage Club Rewards Certificates will not be replaced. Only the person named on the Rewards Certificate may redeem. Photo identification is required for redemption of Slumberland Advantage Club Rewards Certificates. Slumberland Advantage Club Rewards Certificates will not be extended beyond the expiration date. Rewards Certificates are not redeemable for cash and are void if sold for cash or other consideration or if altered. Photocopies, facsimiles or other reproductions of Rewards Certificates are also void. The Slumberland Advantage credit card is issued with approved credit by Wells Fargo Bank, N.A.